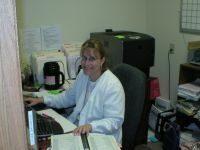 Gail has been with the office since 2005, where she continues to make every effort to ensure the most efficient billing and insurance collecting possible. She takes care of all Insurance claims, BWC, and Personal Injury claims. If you have a question regarding insurance coverage, or your account, please feel free to call and ask to speak with Gail.